Built by Stow & Son yachts of Shoreham in 1912, Desire was 25′ LOA, 24’6″ LWL and 8’3″ beam with a 5′ draught and 360 sq ft of sail area. 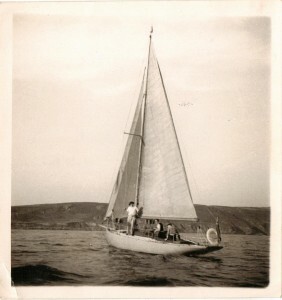 David Mills recalls: “Desire was my father’s boat, bought just after the Second World War. She lived in Salcombe during my childhood. He converted her from gaff to bermudian, and added the little doghouse. “We lived in Ashburton, on the south of Dartmoor. So, for the winter, she was brought around to Teignmouth, had the mast craned out at Morgan Giles’ yard. She was then motored under Shaldon bridge up the river Teign estuary – motive power was a small and very unreliable Watermota engine – to a mud-berth on a bend in the river right by Newton Abbot race-course, at the top of the tide. “The engine (which was, I think, fitted by my father) was very much ‘auxilliary’. She still had rowlock holes on the cockpit combing to enable her, pre-engine, to be rowed with one or two long sweeps. 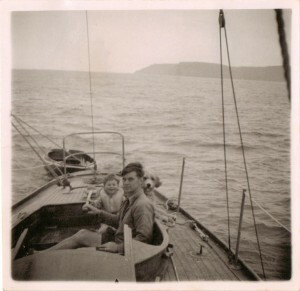 “In the left hand photograph below, the helmsman is my father Ruskin Mills with Bolt Head in the background – with me and the dog Puffin helping with the steering. 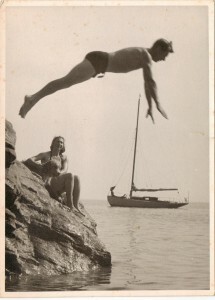 “The diver on the right-hand photograph is also my father, with mother Sue. In the background is Desire at anchor off Galmon Head, just west of Prawle Point.